The new eBeam Edge is the next-generation hardware version of Luidia’s eBeam interactive whiteboard system. 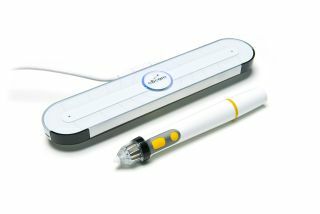 Like previous eBeam systems, it works with standard computers, projectors, and a variety of input devices to transform existing whiteboards and writing surfaces into interactive whiteboards. Users can present, annotate, and interact with projected content, while capturing the results, which can be shared over the Internet. This means teachers can use the device like any other interactive whiteboard, but since it will work on any surface, she can also project onto, for example, a map or another image and “write” on it, which is something you cannot do on a traditional interactive whiteboard. Pros: The Luidia eBeam is light weight and small (weighs less than 4 ounces) and will easily fit in a laptop case. The projection device covers an area of up to 5 feet x 9 feet, requires only one pen, and is extremely easy to set-up and calibrate. The software has an easy-to-use, unique navigation interface. It uses the same software as the Luidia document camera and the Luidia Interactive tablet and interfaces with these devices. Overall evaluation: The fact that all the Luidia products use the same software and interface make them very beneficial and economical when it comes to professional development. Also, the fact that this system uses only one pen and “electronic color” makes more sense than the way other whiteboard systems work.